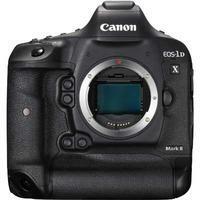 The long-awaited upgrade to Canon's flagship 1D X, the EOS 1D X Mk II is the ultimate digital SLR for professionals. Designed for those who demand the very best results in all situations, the 1D X Mk II delivers images with incredible levels of detail and sharpness, along with smooth, high-performance focus tracking when recording in 4K and lightning-fast AF acquisition when shooting stills at up to 16fps. All of this is made possible by the camera's dual DIGIC 6 processors, full-frame 20.2-megapixel CMOS sensor with Dual Pixel CMOS AF, extended ISO range of up to 409,600 and dual card slots (CF and CFast). The 1D X Mk II also has a 3.2", 1,620K-dot LCD touchscreen, Full HD 1080p movie recording, a weather-resistant magnesium-alloy body, built-in GPS and a 4K "frame grab" mode that allows 8.8MP stills to be taken from 4K video.